I got this brake to fix a problem on my Cannondale CX9 cyclocross bike. The standard cantilever brakes juddered violently on braking due to the carbon fork flexing and stretching the brake cable tighter. This little brake fixed a big problem, and I would recommend it to anyone getting judder with centre pull canti brakes. I would have paid more for a higher spec brake, but that said this one works perfectly. Difference between front and rear? 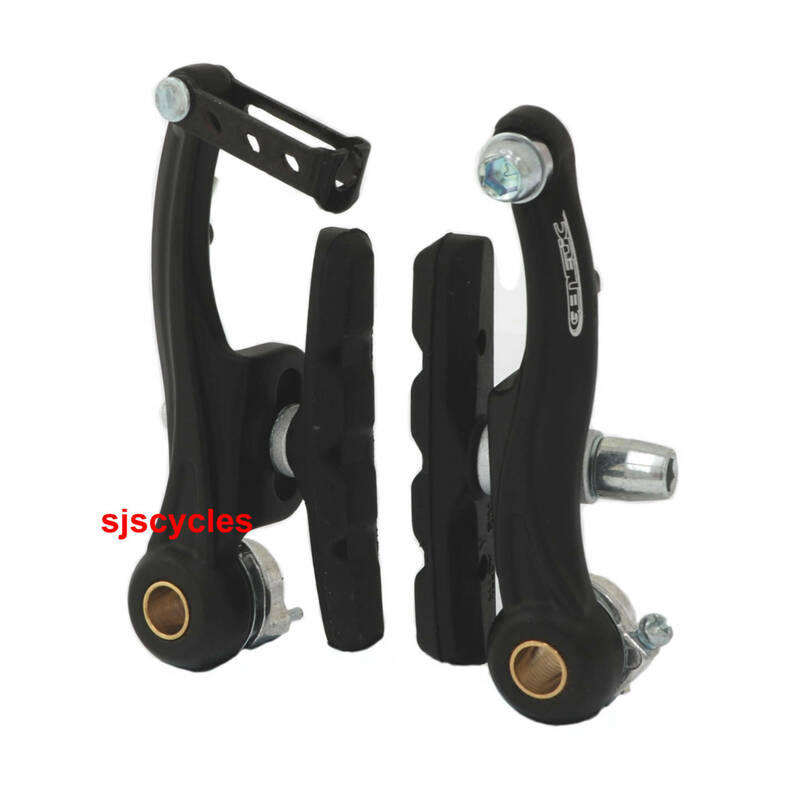 It might seem like a stupid question but what is the difference between the front and rear brake?! I'm converting a hybrid for touring and would like mini-Vs front and rear but feel I may have to settle for a canti on the front due to clearance issues with mudguards. If I bought a set for the back, could I fix them to the front temporarily to see if they would fit my setup or are the front levers significantly different? Simply the orientation of the brake pads. These are Mini-V style brakes that use a different cable pull to regular V-brakes so we would not recommend using these exact brakes with your bike, but most other sets of standard type V-brakes should be suitable. 2" tyres relate to 50mm, generally mini V brakes are okay for tyres up to 35/37mm. Do The Gemini Mini V Brakes Fit On Standard Bosses? a) Are they as powerful as standard size V brakes? If not, b) are they any better than cantilevers? c) Alternatively, as the problem is lack of space below the rear seat bolt (and there is little room for a travel agent), are there any V brakes where the 'other' arm takes the cable (ie on the rear pair, the right one has the noodleholder and the left the cable clamp), as the routing on this frame is along the right of the top tube. These mini brakes are powerful, but due to them having slightly less leverage than standard V-brakes they will be slightly less powerful. They will however still be much more powerful than most cantilever brakes. Unfortunately all of the V-brakes we stock have the noddle fitting from the left hand side.